Have you ever wanted to embark on a journey to the Sun and neighbouring galaxies? If so, your options are two - save up and wait until Elon Musk's grandchildren launch SpaceX's space tourist program, or pick up Solar Flux Pocket, which is now free in Google Play, and only a dollar in the App Store. SFP is set in the year 2107, when PhoneArena will be exactly 106 years old, and the universe is in a state of decay. The game is about you, a space station commander, saving dying stars from extinction. Using a specialized space craft, you will navigate all sorts of interstellar obstacles in missions to deliver plasma fragments to dying suns - all set against spacey ambient music and dazzling galactic backdrops. Sounds like a trip, no? 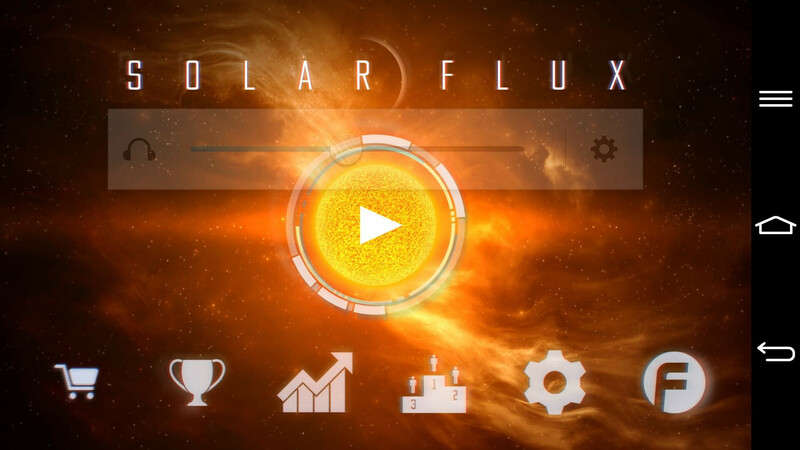 From the very moment we launched Solar Flux Pocket, it was clear that this game is made by space geeks for space geeks. It has that dreamy, floaty, starry portrayal of space that keeps our eyes glued to shows like "Cosmos". The gorgeous space backdrops also reminded us of the PC game Freelancer from 2003, which we fondly remember. Anyway, SFP is a beautiful game. It utilizes sharp 2D graphics with awesome 3D lighting effects to bring its universe to life. Everything in this game, from navigating the menus, to the missions themselves, moves in the same low-gravity tempo. It definitely makes an impression, and after playing it for a while, SFP comes across as one of those rare "designer's" games. It's hardly an accident that it was nominated for "Best Game Design" at the TIGA 2013 conference. Dreamy and floaty is exactly how we'd describe the gameplay, too. 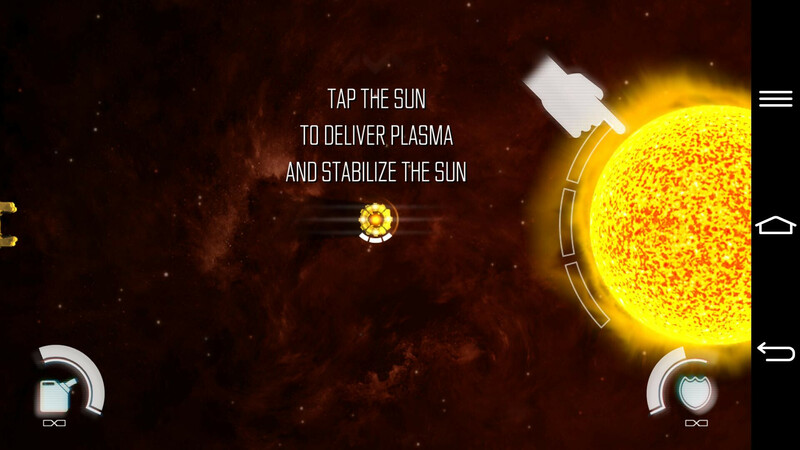 The basic setting is that you are stationed on a space platform to the left, while a dying Sun glows to the right, and in-between are plasma fragments, which you must collect and deliver to the star in peril. This happens with a small spaceship that detaches from the space station and floats into space. 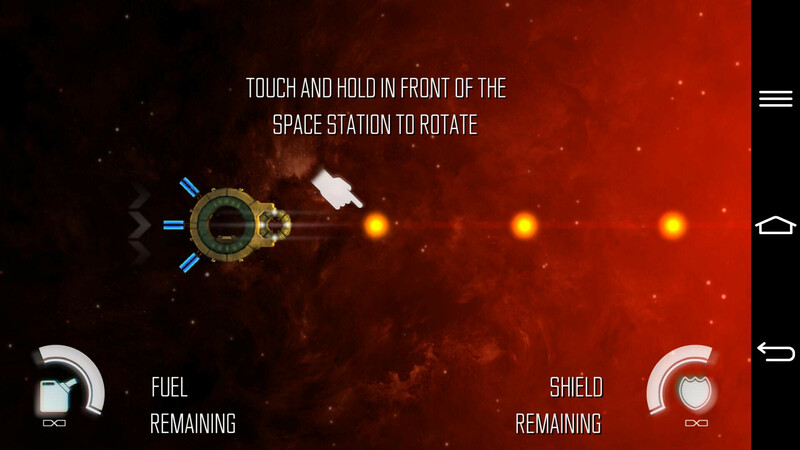 The ship controls by holding your fingers on your device's display in the needed directions. You will have to develop a pretty good sense of momentum to be able to efficiently fly the little capsule between asteroids and other obstructions. It is frustrating at times, but thankfully, not nearly as agonizing as Flappy Bird. However, there isn't much room to fly aimlessly and enjoy the starry view, as the ship's fuel is limited. It will take a few tries before you grasp the right path for every level, but eventually, you'll make it. And when you manage to save the Helios galaxy from doom and gloom, don't look for a well-deserved hero retirement, as there will be three more worlds to rescue. Overall, the gameplay is highly original. We're pretty seasoned gamers and we felt like we haven't really played anything like this. The game's absence of a major storyline counts as a surprising plus, because this means SFP won't be a game that glues you to the screen until it's over in a meager hour or two of fun. Actually, the game's leisury pacing, relaxing atmosphere, and simple but challenging gameplay make it perfect for a quick play on any occasion. Although the core mechanics remain the same in every level, somehow SFP doesn't become repetitive. And since it's challenging enough, you won't be simply going through the motions playing it - even if you're gaming for five minutes on a subway trip, you can be sure your attention will be fully invested in them. Mindfulness practitioners will find Solar Flux Pocket a space-flavored blessing. Why is the rating color yellow instead of green even though the score is 9! ?